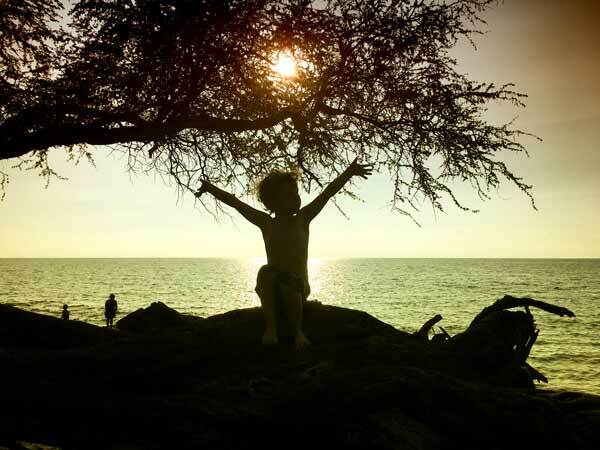 We are a Creative Team located on Hawaii Island. GripCurrent is a small shop dedicated to each client’s individual needs. We pride ourselves in developing custom solutions tailored to your business. We Mix Design and Marketing to create positive Return on investment. Your Business Needs a Trusting Partner to Manage Your Brand Online. As Web Developers we shine, we are in the business of creating affordable custom websites that help create new clients. Developing Your Brand Identity is of Utmost Importance. Get Started! We can market your business online through PPC, Display Network Targeting, Social Media Outreach, and Many other Methods. We are always here for you, ready to make changes and give the support you need. Our clients all have different needs – with GripCurrent they know they have a True Partner in Business. 1. Give us a Call for a Free Consultation. Visibility, Confidence, and Authority are the beginning benefits of developing your online presence with GripCurrent. Experience true professional dedication, strategic goal oriented growth, and the peace of mind that comes from never having to worry about hosting, account set-ups, or technical babble. We Know How to Get You Seen Online. Be Confident We Will Work to Maximize Your Small Business’s Profitability. After University study in computer engineering and earning a degree in business management; Josh spent a decade managing multiple small businesses in the construction and real estate industry. At GripCurrent we partner with small businesses that we believe in. The path to success starts with a modern website; followed by getting your brand seen online. If someone is searching for your business or products, we want you there Ready to Deliver! Most of our small business clients don’t go to crazy with their web design. Complete Website Building prices usually range from $750 to $2500. We also do e-commerce and more. All sites need a few things for todays’ mobile and search based world. Responsive sites work well across all browsers and devices. They also incorporate search engine optimization into their design and content. Getting seen online works one of two ways; typing in your sitename or being found on another website (Google). Monthly minimums starting at $625 including hosting & analytics. Getting to the top of a Google page for your business’s product or service translates into income. Let us Help, everything we do involves gaining rank and delivering the content your client is searching for. We Target Affordable Campaigns with Solid +ROI; It’s always a challenge. From a few $100 dollars per month to PPC starting in the few thousand; we can find a plan that fits. We Minimize Budget Waste. The biggest mistake small businesses make with their marketing and advertising budget is starting un-optimized and un-tracked Advertising Campaigns. Let us help you start an optimized track to success. A big part of your website’s design is it’s visual presence. Build or update your company logo, artwork, and photos. We can build and optimize your digital portfolio or catalog. We do in-house graphic design. Instead of paying thousands for outside design agencies and working through long approval processes we do our own work. This cuts time and decreases price for our clients. We Specialize in Small Business. 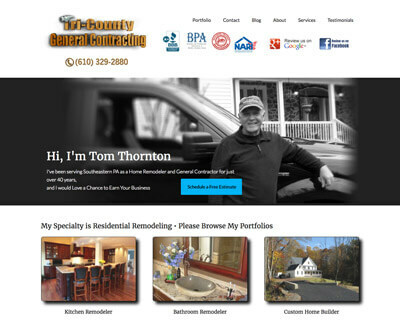 TomRemodels.com is the home of Tri-County General Contracting. The Thornton’s family business. The home of Cypress Door & Glass; Philadelphia’s Premier Commercial Glass Installer. 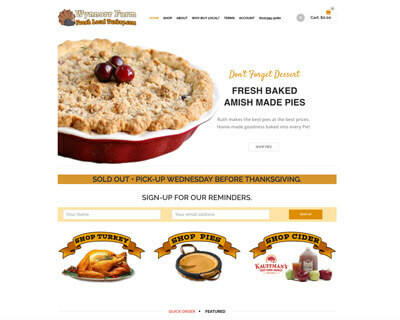 Online Thanksgiving Turkey Sales in Southeastern PA.
FreshLocalTurkey.com is an e-commerce seasonal website for selling Thanksgiving Turkeys in Southeastern PA. CLIENT: Family Farm Consultants LLC. Jersey Architectural is a commercial glass and door company serving Atlantic City NJ since 1923. 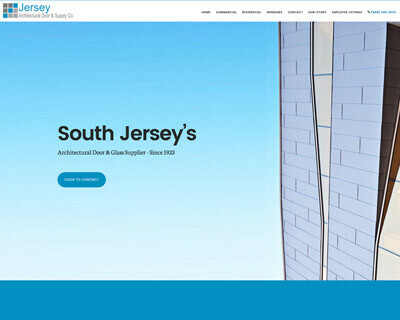 CLIENT: Jersey Architectural Door & Supply Co.
We use Organic SEO to Score in Search. That means your placements are long lasting, helping your sites value climb. We like being the one-stop shop for your business website needs. We get it done In-house, in Hawaii. If there is something you need we can probably help, just let us know. Here is a little info on our skill set. Check out this chart- It shows where we spend our time helping our clients businesses grow. As you can see building a website is just the beginning. Almost all of our clients websites are built as WordPress sites. Unless you are building a large social or e-commerce site, WordPress is usually the go to for a reliable and easy to update platform or CMS (Content Management System). Want to know more about WordPress and the path to success online? Give us a call, we love talking story!